Hi, I’m Jenny! I blog at Sprinkles & Sundresses. I’m a sophomore in college blogging about my life as a transfer student, and pretty much everything and anything that I feel like! I love baking, Gilmore Girls, and anything brightly colored! Like I said, I love to bake! I could say I love to cook, but mostly I love to bake. Desserts all the way! Today, I’m going to share two holiday recipes that I made for my family over Thanksgivukkah! 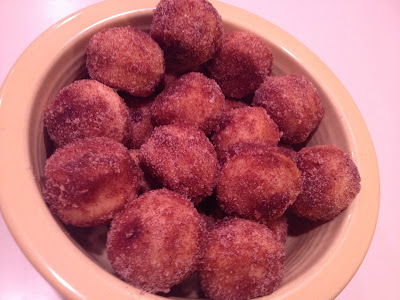 The first recipe is for mini baked jelly doughnuts. Jelly doughnuts are a traditional Hanukkah dessert. Hanukah is all about celebrating the miracle of oil that burned for eight nights when it was only supposed to last for one. All of the traditional Hanukkah foods are fried in oil. I made baked doughnuts rather than fried so it may defeat the traditional purposes but they were still delicious! You can find the recipe I used here. I followed it almost exactly except for one pretty important part- the filling. The recipe calls for 1 cup of jam mixed with 1/4 cup water. Let me tell you, unless I did something wrong that I didn’t realize, that is an absolutely ridiculous amount of filling. I used straight jam and I used about 1/4 cup total. The thing about baking the doughnuts instead of frying them is when they first come out of the oven they look like muffins or cupcakes. That means, you guessed it, they aren’t hollow! I still managed to pipe some filling in but it was a pretty tiny amount. If anyone figures out how to fit even close to the amount of filling this recipe calls for, please let me know! The second recipe was for a holiday favorite I know everyone loves- peppermint bark! This one was a huge hit with my family! I used a recipe found here but peppermint bark just calls for melting and re-hardening chocolate. It’s super simple. The thing about this recipe that I really liked was that rather than just white chocolate, it called for a layer of milk chocolate in between two layers of white! I opted for semi-sweet instead of milk but I’m sure it would be good either way. I didn’t let the second layer harden enough before adding the top layer of white chocolate and the semi-sweet started to melt while I was spreading the layer on! That’s why it’s an awkward shade of brown. It didn’t affect the taste at all, I promise! The plus side of making peppermint bark? Crushing up candy canes is actually really fun. Let me know if you try these recipes! I’d really love to hear from you. I hope you all have wonderful holidays!